The main difference between proteoglycan and glycoprotein is that in proteoglycans, one or more glycosaminoglycan chains are attached to the protein while in glycoproteins, oligosaccharide chains are attached to proteins. Furthermore, proteoglycans mainly occur in connective tissue while glycoproteins occur in the cell membrane. 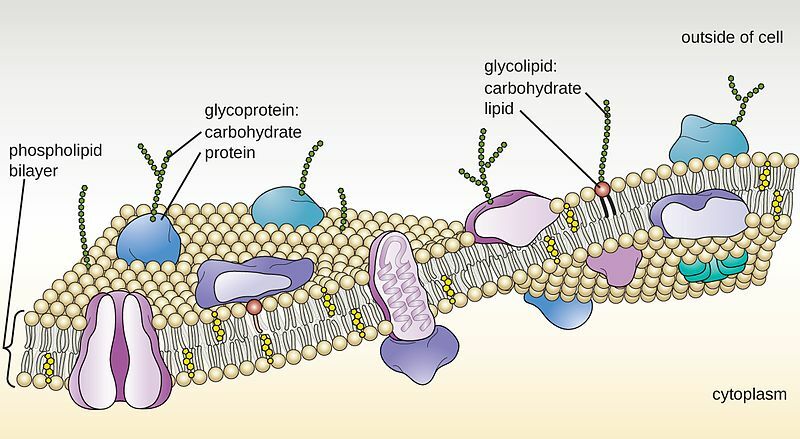 Proteoglycan and glycoprotein are two types of glycoconjugates in which carbohydrates are covalently linked to proteins. Some other types of glycoconjugates include glycopeptides, peptidoglycans, glycolipids, lipopolysaccharides, etc. A proteoglycan is a glycoconjugate, a biomolecule with a core protein covalently attached to glycosaminoglycan (GAG) chains. Glycosaminoglycans or mucopolysaccharides are long, unbranched polysaccharides comprising of a repeating disaccharide unit. Since proteoglycans are made up of polysaccharides, they are a type of heavily glycosylated glycoconjugates. Serine (Ser) residues of the protein serve as the point of attachment to the glycosaminoglycan chains and the attachment occurs through a trisaccharide bridge. The serine residue generally occurs in the Ser-Gly/Ala-X-Gly sequence where the X can be any of the amino acids. But, not all serine residues are attached to GAG chains. Under physiological conditions, the GAG chains are negatively-charged due to the presence of sulfate and uronic acid groups. Proteoglycans are one of the main constituents of the extracellular matrix (ECM), which fills the space around cells. They combine with collagen to form cartilages to provide structural and mechanical support. Also, by the hydration due to the association of water with proteoglycans, cartilages provide cushioning effect to the joints. However, the insufficient breakdown of proteoglycans in the body is linked to several genetic diseases and can lead to some disease conditions. A glycoprotein is another type of glycoconjugate, which is less heavily glycosylated. In glycoproteins, oligosaccharide chains or glycans are the type of carbohydrates covalently attached to the core protein. The attachment of oligosaccharides occurs either during cotranslational or posttranslational modifications known as glycosylation. Generally, the extracellular proteins that are going to be secreted are glycosylated in the endoplasmic reticulum. Also, the extracellular segments of the proteins are glycosylated. This means most proteins in the cell membrane are glycoproteins. The main function of the proteins in the cell membrane is to serve as recognition molecules and they are involved in cell signaling as well. The two main types of glycoproteins are O-linked glycoproteins and N-linked glycoproteins. In O-linked glycoproteins, the carbohydrate links through the O atom of the –OH group of the amino acids, serine or threonine. In N-linked glycoproteins, the carbohydrate links through the N atom of the –NH2 group of amino acid, asparagine. Proteoglycan and glycoprotein are two types of glycoconjugates. Both are made up of proteins to which carbohydrates are covalently attached. They occur in the extracellular matrix. They are involved in human tissue processes as well as immunological functions. Also, their effect on wound healing, viral pathogens, and liver cancer are evaluated by scientists. A proteoglycan refers to a compound consisting of a protein bonded to glycosaminoglycan groups, present especially in connective tissue while a glycoprotein refers to any class of proteins which have carbohydrate groups attached to the polypeptide chain. 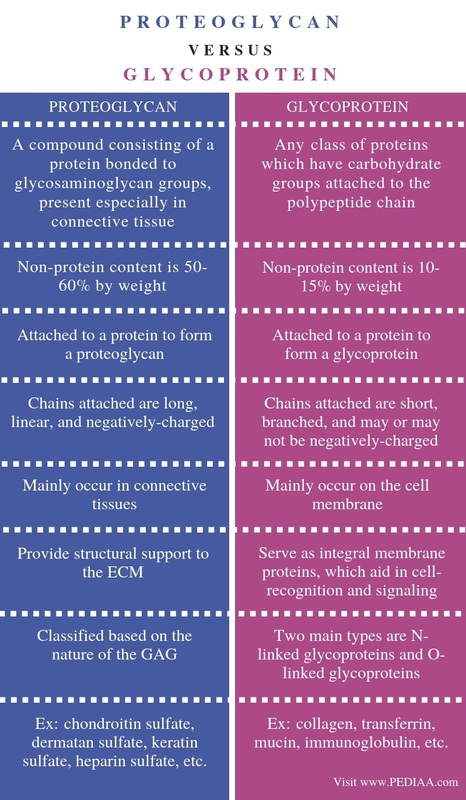 This is the main difference between proteoglycan and glycoprotein. Also, the non-protein content of a proteoglycan is 50-60% by weight while the non-protein content of a glycoprotein is 10-15% by weight. Glycosaminoglycans are attached to a protein to form a proteoglycan while oligosaccharides are attached to a protein to form a glycoprotein. This is one other main difference between proteoglycan and glycoprotein. Furthermore, the chains attached to a proteoglycan are long, linear, and negatively-charged while the chains attached to a glycoprotein are short, branched, and may or may not be negatively-charged. The location of occurence is another important difference between proteoglycan and glycoprotein. Proteoglycans mainly occur in connective tissues while glycoproteins mainly occur on the cell membrane. Moreover, the proteoglycans provide structural support to the ECM while glycoproteins serve as integral membrane proteins, which aid in cell-recognition and signaling. Proteoglycans are classified based on the nature of the GAG while the two main types of glycoproteins are N-linked glycoproteins and O-linked glycoproteins. 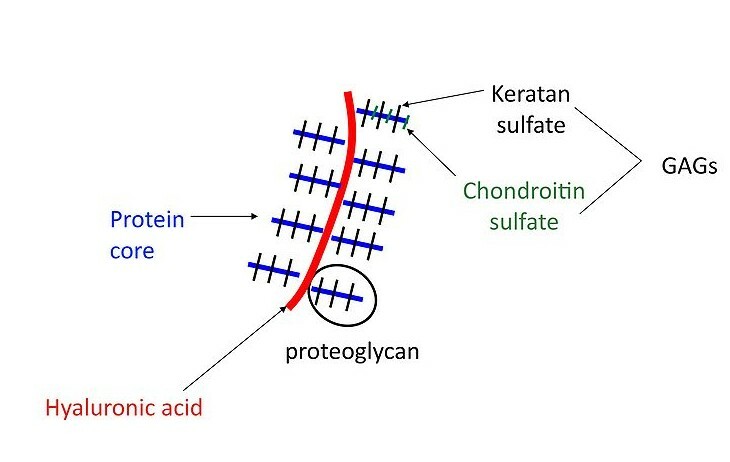 Some proteoglycans include chondroitin sulfate, dermatan sulfate, keratan sulfate, heparin sulfate, etc. while some glycoproteins include collagen, transferrin, mucin, immunoglobulin, etc. Proteoglycans are the proteins covalently attached to the glycosaminoglycans while glycoproteins are the proteins covalently attached to oligosaccharides. Proteoglycans mainly occur in connective tissue while glycoproteins mainly occur in the cell surface. Proteoglycans provide strength and cushioning effect to the cartilage and glycoproteins serve as integral membrane proteins in cell recognition and cell signaling. The main difference between proteoglycan and glycoprotein is the type of carbohydrates attached to the protein, the location, and the function.